I promise you that this is the best ice cream you will ever make at home. We stumbled on Jeni’s Splendid Ice Creams at Home a couple years ago and I believe the first recipes I made from this book were the Kona Stout and the Roasted Strawberry and Buttermilk for Matt’s company picnic. Both flavors got such rave reviews, that when I went to buy this book for my friend, Anna’s birthday, a week later, Barnes and Noble told us that they’d recently sold the rest of their copies – all to Matt’s co-workers, it turned out 🙂 I think the way Jeni makes ice cream is a revelation. She combines a bit of cornstarch into the base and then adds just one and a half ounces of cream cheese per quart recipe, and the texture and consistency turns out amazing. Perfectly creamy, freezes well, and her flavors are never too sweet – always a perfect balance. The recipes in this book range from really unique (gouda and vodka plumped cranberries) to traditional (vanilla bean) to genius (sweet potato with torched marshmallows – gotta try this one, next). Summer time is the perfect time to buy this book and try out a new recipe at each and every opportunity you get. Our little ice cream maker will get a work out during these hot months to come! But we have faith that it feels it is finally getting to do what it was created to do, thanks to Jeni’s Splendid ice creams and our not-so-splendid hundred degree days! This week, I made three flavors out of this book: Brown Butter Almond Brittle, Roasted Pistachio and Bourbon Butter Pecan. All amazing. The Almond Brittle was the most requested at our church get-together last night, and the most consumed (although I adore the pistachio), so I’ve written out the recipe for you here today. It calls for almost a pound of butter. ACTUALLY you only use a tablespoon of that pound of butter. 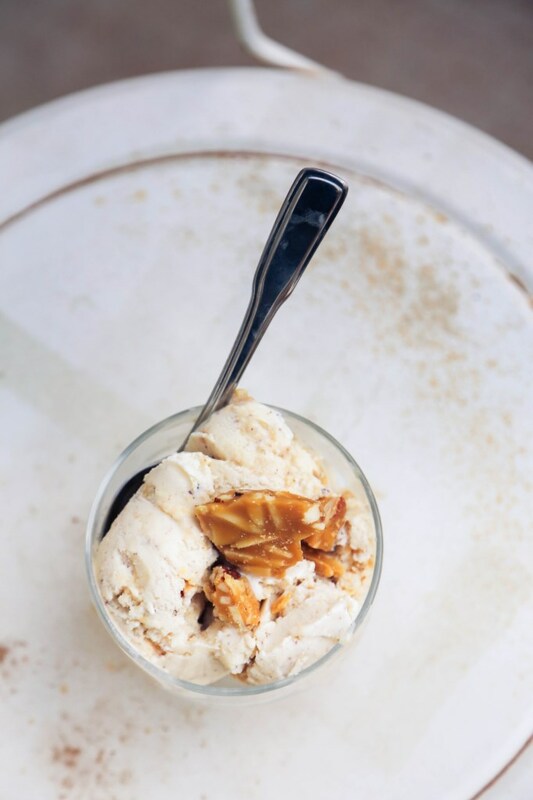 The solids that settle to the bottom of the pan after you brown butter is what gets mixed into the base and it creates a divinely nutty, roasted flavor in the ice cream base. Yet another way brown butter makes the world a better place. Add the remaining milk, cream, sugar and corn syrup to the butter solids, bring to a rolling boil over medium-high heat and boil for 4 minutes. Remove from the heat and gradually whisk in the cornstarch slurry (you’ll need to stir it up again as it will settle and solidify some). Bring the mixture back to a boil over medium high heat and cook, stirring with a heatproof spatula or whisk, until slightly thickened, about 1 minute. Remove from the heat. Pour the ice cream base into the frozen canister of your ice cream maker and spin until thick and creamy. 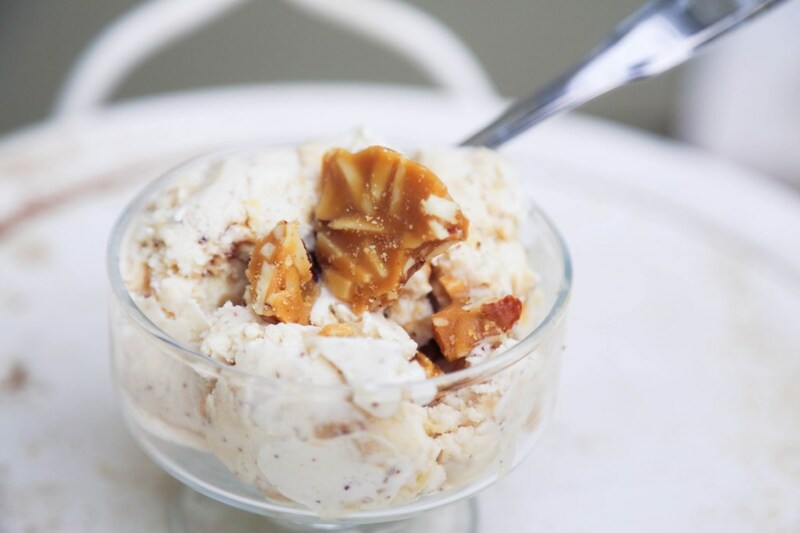 Pack the ice cream into a storage container, folding in the chopped almond brittle as you go. Press a sheet of parchment directly against the surface of the ice cream (this is important to avoid freezer burn and maintain a good consistency) and seal with an airtight lid. Freeze until firm, at least 4 hours. Generously oil a large baking sheet. Combine the sugar, corn syrup, water, and salt in a 4 quart saucepan and bring to a boil over medium-high heat, stirring to dissolve the sugar. Insert a candy thermometer in the pan, add the butter, and bring back to a boil, then cook until the mixture reaches 300F. Remove from the heat and immediately stir in the almonds and then the baking soda, working quickly but combining them thoroughly. *recipes taken nearly word for word from Jeni’s book. 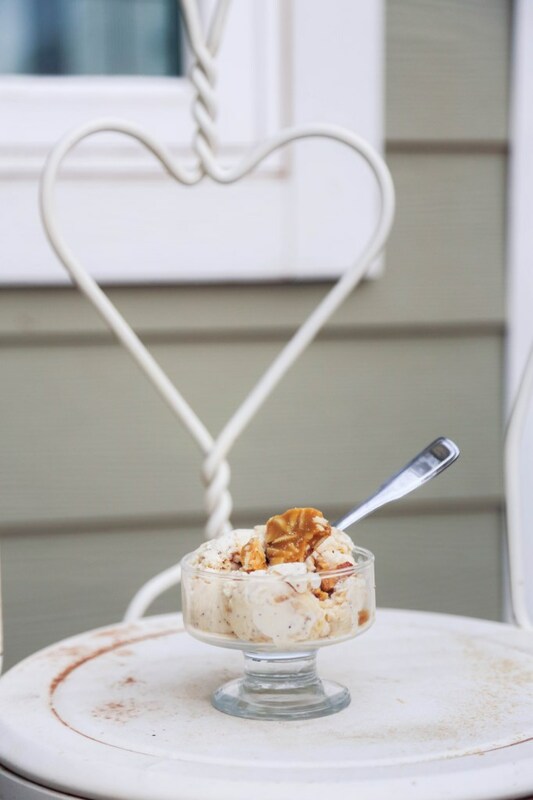 This entry was posted in Butter, Cheese, Desserts, Ice Cream, Snacks, Weekend Fare and tagged almond brittle, brown butter, butter, cream, dessert, ice cream, Jeni's Splendid Ice Creams, milk, sugar, summer recipes, summertime, sweets. Bookmark the permalink.